At Pilates Fitness, we believe that our biggest asset is our committed and passionate staff – from our Pilates instructors to our executive and management team. Without our committed and passionate team, we will not be able to provide quality lifestyle Pilates Programmes to our members. In return, Pilates Fitness has created a business structure that supports its Pilates studio employees, develops skills and talents, and rewards outstanding performance. Pilates Fitness in Singapore is seeking committed and passionate Digital Marketing Executive to create compelling marketing campaigns through engaging and refreshing content. The right candidate will need to love sharing stories through creative content – blog articles, aesthetically pleasing photos and compelling videos. You are familiar with wordpress, woocommerce, video and photo editing softwares as well as SEO practices. You enjoy working out and is kept abreast of fitness trends. You like to listen and chat with people and enjoy making new friends. Full-time, Part-time, Contract positions available. Pilates Fitness in Singapore is seeking committed and passionate Trained/Certified Pilates instructors to teach group & private clients. We are the first Pilates studio in Singapore and Asia to provide functional, lifestyle Pilates programmes to our clients. Pilates instructors will need to develop Pilates programmes to meet specific individual needs of their clients. Programmes should incorporate Matwork, Reformer, Stability Chair and other exercises on STOTT PILATES equipment. The right candidate will need to be a fantastic listener, friendly and approachable. Before you can give someone a fitness goal, you need to know what it is they want to achieve. It could be getting back onto their feet after an illness/injury, improving at their sport or just getting into shape. It’s different for everyone, which is why we value the ability to listen. You need to inspire and help individuals every step of the way, wherever it is they want to go. You also need to be highly motivated with a strong customer service focus and have the flexibility ensure your classes meet our member’s needs. Preferably STOTT PILATES Trained or Certified Instructor. Other International recognized Pilates Institute will also be considered. Pilates Fitness is committed to rewarding top performers and team players who provide excellent workouts and quality customer service. We offer attractive remuneration package to successful candidates. Please contact us with your resume and availability. It is a bonus if you can start immediately. Wall Street Journal reported that the Pilates Industry is growing at 12% year on year. 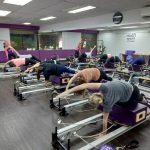 Compared to other Fitness disciplines, the interest level in Pilates in Singapore is growing exponentially as more people learn about its rehabilitation and fitness benefits. It is probably the only fitness program that one can continue to practise as one nurses injuries with no gender and age limit, making it an extremely versatile workout for people at all stages of their lives. To meet the growing needs of our clients, we are looking for experienced Front Desk Sales executives. This position is at the front line, connecting with customers and partners. Fun & vibrant environment with sweet clients who are always bringing snacks for the Studio Associates! Pilates Fitness is committed to rewarding top performers and team players who over achieve KPIs, and provide quality customer service. Please contact us with your resume and availability. Minimum of 3 shifts per week (for part-timers).